It was one of corporate America’s biggest hidden profit centers in the past decade — the tax shelter — and it became so lucrative that last year it helped major U.S. companies cut their tax rate to just half of what they had historically paid, leaving individual taxpayers to make up the difference. The General Accounting Office estimates that illegitimate tax shelters cost the government more than $85 billion in recent years. “Anything that’s not being paid that should be paid, that’s basically what the honest taxpayer is making up,” asserts Charles Rossotti, a Republican businessman who became commissioner of Internal Revenue in 1997 and spent five years battling bogus shelters. Rossotti estimates that because the government is not collecting all that is owed — the biggest piece of which is illegitimate tax shelters — everyone else is paying 15 percent more than they should. A commentary by FRONTLINE correspondent Hedrick Smith. How investigating “Tax Me If You Can” led producer Rick Young into the sewers of Bochum, Germany. In “Tax Me If You Can,” FRONTLINE correspondent Hedrick Smith investigates the rampant abuse of tax shelters since the late 1990s. Through interviews with government officials, tax experts, and industry insiders, Smith uncovers an avalanche of bogus transactions — created by some of America’s biggest and most-respected accounting firms, law firms, and investment banks — that were then aggressively marketed to big corporations and wealthy individuals. To overcome this problem, Rossotti argues that Congress must now enact sweeping legislation to ban any tax shelters that do not have legitimate business purpose. And he warns of the danger of inaction. In “Tax Me If You Can,” Smith follows the tax shelter trail to some surprising places. Smith discovers that sewer pipes in the city of Bochum, Germany, for example, have offered a huge tax write-off to the major American bank Wachovia, of Charlotte, NC. It was a deal that Bochum city officials couldn’t refuse: Through a complex, long-term lease-and-service transaction, the city would lease out its underground sewer pipes to Wachovia for $500 million. The city would then immediately lease the pipes back, thus retaining use of its sewer system, and repay the lease over a period of many years. In return, Bochum was immediately paid a $20 million fee. Wachovia would eventually get its money back — plus a fast, multi-million-dollar tax write-off. Wachovia declined to be interviewed by FRONTLINE. But working with Wachovia’s annual reports, Robert McIntyre, director of the Institute for Taxation and Finance, details the payoff to Wachovia’s bottom line from many leasing deals similar to the Bochum transaction. 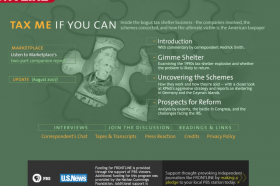 “Tax Me If You Can” also reveals how some of America’s most respected accounting firms drove the tax shelter wave, generating dozens of shelters that were mass marketed and then found to be illegitimate by the IRS and the courts. In the documentary, Smith speaks with a former tax attorney for KPMG, who describes how the firm’s accountants and attorneys were ordered by KPMG tax executives to design — and market aggressively — as many tax shelters as possible, since the firm made a profit based on how much it saved its clients in taxes. KPMG declined to speak to FRONTLINE. But recently the firm fired and/or retired several of its leading tax partners who had overseen KPMG’s tax shelter operation, after they had been called to testify in a congressional investigation. And on Feb. 19, the company announced that federal prosecutors have launched an investigation related to “certain tax strategies” no longer offered by the firm. “Tax Me If You Can” concludes by reporting that while the Republican-controlled U.S. Senate has passed broad tax shelter reform legislation, both the Bush administration and private sector companies, such as accounting and leasing firms, oppose a Senate-backed provision requiring that shelters have economic substance and genuine business purpose to be legal. The House of Representatives has so far declined to pass such legislation, which remains bottled up in the Ways and Means Committee.